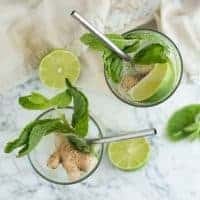 This Ginger Lime Refresher is a cool and refreshing drink that will remind of you of a classic mojito, with a hint of ginger. With less sugar and zero alcohol, this mocktail is a beverage you can sip on all day long! Ginger lime is a combo that I’m so totally obsessed with these days. The refreshing lime flavor that wakes up your taste buds and kicks your water up a bit. And then the ginger – oh the ginger. I’m so in love with everything ginger. The spice. The bold flavor. It’s just my favorite. In fact, ginger is a relatively new love of mine. I didn’t realize how much I loved it until just a few years ago. And now I want ginger in all the things. OOOOH I’m getting hungry now! So watch for that, especially this fall and winter. Yeah, so it was only natural that a ginger simple syrup became the main ingredient for my summer bevy of choice. And let’s talk about that for a second. Cause you’re probably seeing here in the ingredients list that there’s no adult additions of alcohol. Over the years, I’ve found that my body does not handle the alcohol situation anymore. Even a glass of wine can wreak havoc on my system, putting me down for an entire day. I used to just muster through it and deal with the pain after drinking a glass or two. But you know what I realized? I was losing days of my life just for a glass or two of wine! And life is short. Way too short. I’m all about living intentionally, and I refuse to let days pass me by without actually living and enjoying them if I can help it. So a few months ago, the decision was made. No more alcohol for this mama. Waaaaaahhhh! Yeah, I’m still a bit sad about it. I mean, I’ve cut out meat. I’m cutting out cheese (but thanks to my favorite vegan cheese, I’ll live). And now alcohol?! I swear, if anyone tries to take coffee away from me, there will be punches thrown!!! So because of this new alcohol-free zone my body is, I’ve been looking for other options. Because I still love sitting on the deck sipping on something refreshing. I still love having a drink in my hand at social events. But do I just want to drink water? nope. Do I just sip on sugar-filled juice and soda at social events? nope. So I took matters into my own hands and made a super yummy drink that will keep me refreshed all summer long without all the alcohol and added sugar. 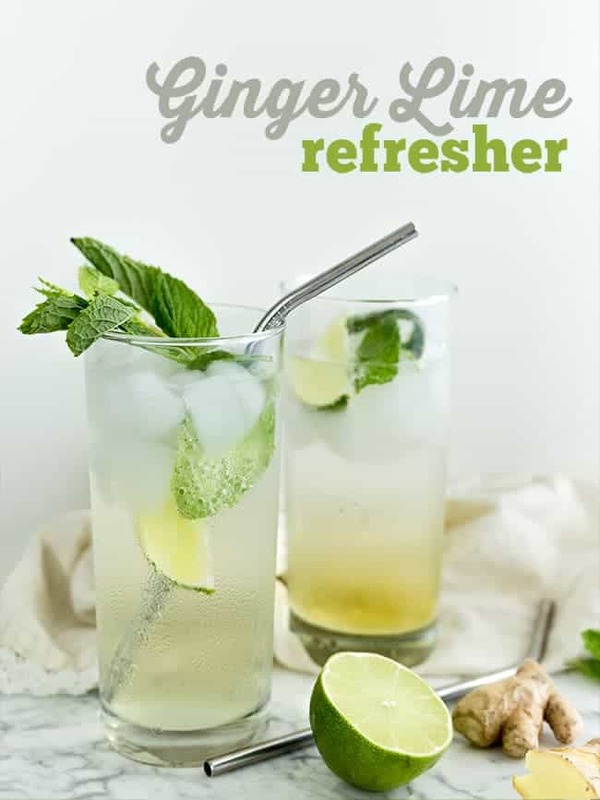 This ginger lime refresher is so light and cool. And that hint of spice from the ginger just gets you in the right spot on your tongue. It’s fun. It’s simple. And it’s what should be in your hand the next time you’re sitting outside enjoying summer with your friends and family. 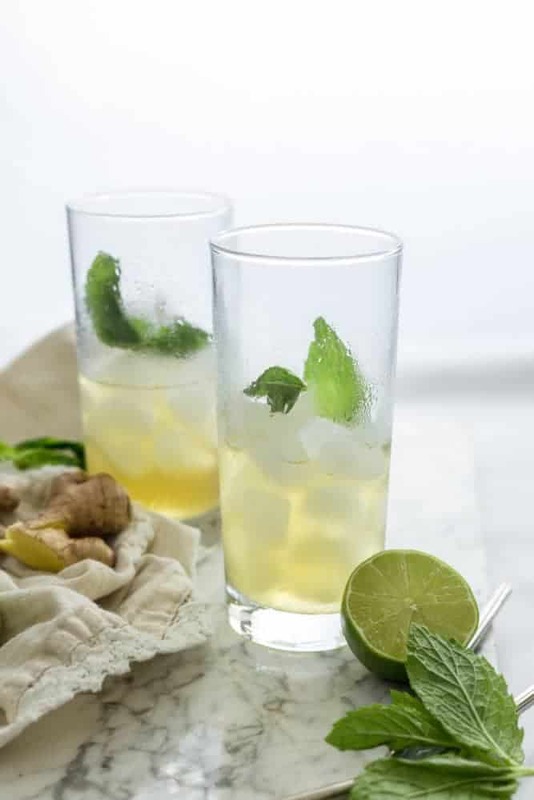 This Ginger Lime Refresher is the go-to drink of the summer. So crisp and simple! 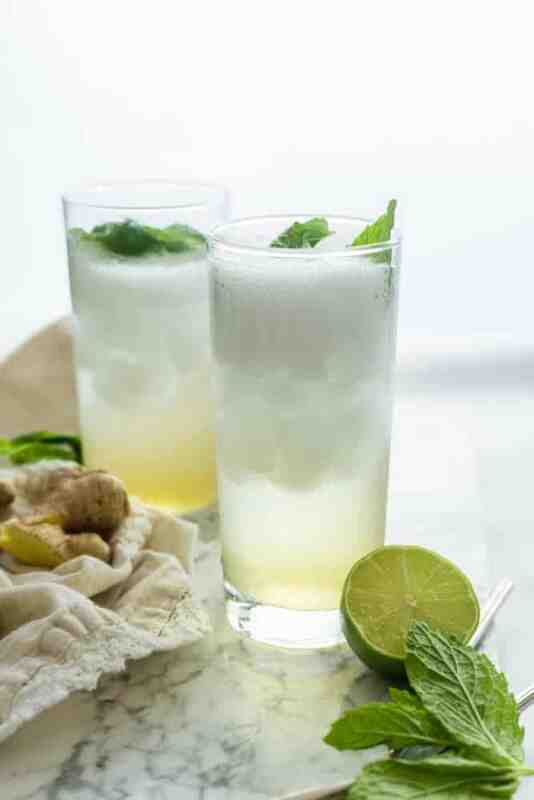 A cool and refreshing drink that will remind of you of a classic mojito, with a hint of ginger. 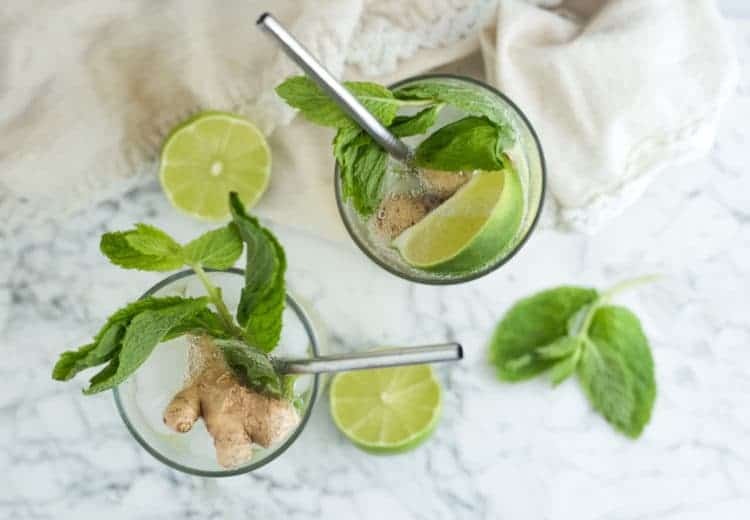 With less sugar and zero alcohol, this mocktail is a beverage you can sip on all day long! Roughly chop fresh ginger. There's no need to peel it. Bring to a boil with water and agave in a small saucepan. Once boiling for a minute or two, simmer for 15 minutes. Strain ginger out and let cool completely. Store in the refrigerator until ready to make drink. Muddle a few sprigs of mint in the bottom of a glass just enough to bring out some scent and flavor. Fill glass with ice. Pour chilled ginger simple syrup in glass about 1/4-1/3 of the way, depending on how gingery you want it to taste. Fill to top with lime-flavored sparkling water and a couple squeezes of lime juice. 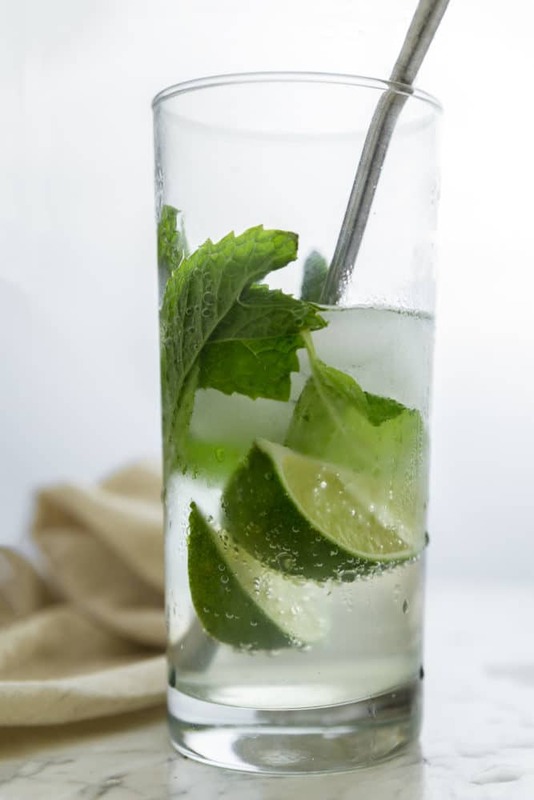 Stir and top with a sprig of mint. And tag me on Instagram (@happyfoodholly) if you make this yourself!